The statistic shows the gross domestic product (GDP) per capita in Japan from 2012 to 2017, with projections up until 2022. 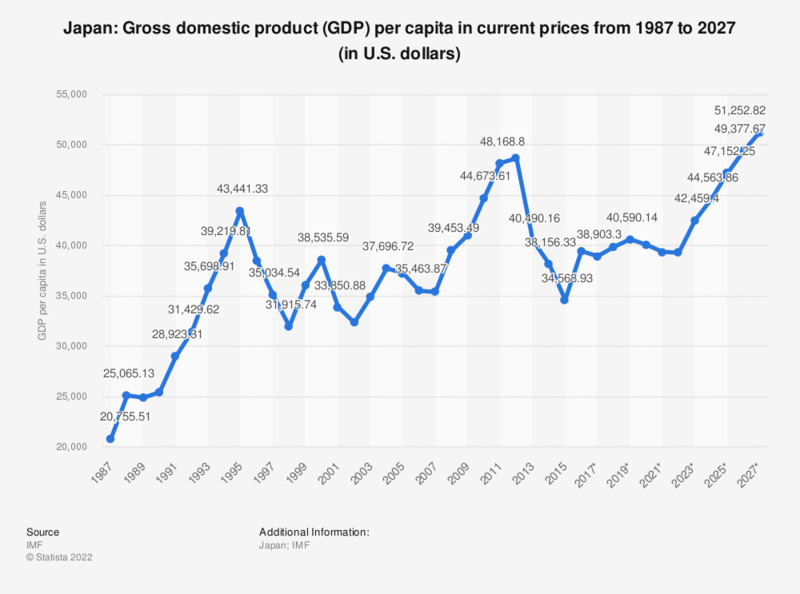 In 2017, the gross domestic product per capita in Japan was around 38,448.57 U.S. dollars. For further information, see Japan's GDP. Japan is the world’s second largest developed economy and a member of the Group of Eight, also known as G8, which is comprised of the eight leading industrialized countries. Due to a weak financial sector, overregulation and a lack of demand, Japan suffered substantially from the early 1990s until 2000, a time referred to as ‘’The Lost Decade’’. Japan’s economy is still slowly recovering from the country’s asset price bubble collapse; however it continues to struggle to retain economic milestones achieved in the 1980s. Japan’s response to the crash was to stimulate the economy, which in turn resulted in extensive amounts of debt that further increased into the 21st century, most notably after the 2008 financial crisis. Despite maintaining a surprisingly low unemployment rate, demand within the country remains inadequate, primarily because Japanese residents spend a rather small fraction of the money they earned from the workplace. Lower demand often has a direct effect on production, with companies seeing not enough profits to continue production at such a high rate. Based on the consumer confidence index, Japanese households found that their quality of life, income growth, employment and propensity to durable goods was below satisfactory standards, perhaps due to these households still experiencing the effects of the 1990s bubble crash.